Poetry is a passion for sharing our experiences of love, humanity, honor, death and reminiscences. The Flamenco Poets Society is a non-profit organization based in Houston that is dedicated to promoting an appreciation and understanding of Latin American & Spanish poets and the Flamenco Arts. The Flamenco Poets Society strives to convey the emotions of these poets who have recorded their experiences through the written word. Our readings and programs are held at various locations throughout Houston, and we organize two bilingual readings per year. 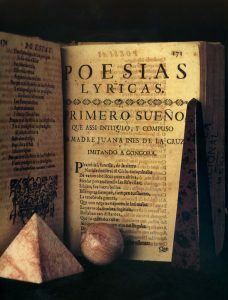 Past programs have featured the works of such diverse writers as Federico Garcia Lorca, Pablo Neruda, Rubén Darío, Gabriela Mistral, the Anthology of Flamenco Poetry, Julia de Burgos, Sor Juana Inés de la Cruz, Octavio Paz, César Vallejo, Rosario Castellanos and Kyra Galván. In addition, the Society presents an annual storytellers event and our popular Café Cantante series mixes poetry with flamenco music, dance or film. The vision of the Flamenco Poets Society is to make Latin American and Spanish literary culture accessible and appreciated by the general public. We look forward to having you attend one of our future events.